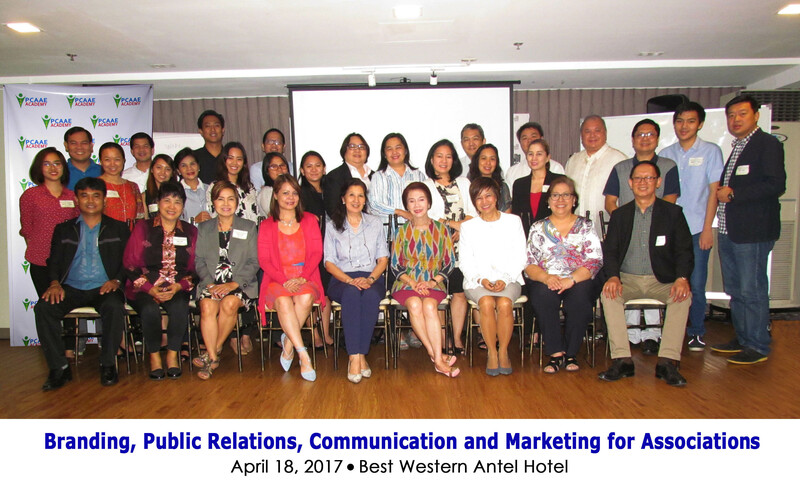 The Philippine Council of Associations and Association Executives (PCAAE) conducted on April 18, 2017 a seminar on “Branding, Public Relations, Communication and Marketing for Associations” at the Best Western Antel Hotel, Serenity Tower in Makati, Metro Manila. The event was attended by 32 PCAAE members who earned points towards becoming a Certified Professional Association Executive (CPAE). The CPAE program was developed by PCAAE to further professionalize association governance and management in the country and offers excellent career opportunities and growth for those already working or those considering to work in the association sector that includes Board members, officers, staff and professionals. The event covered four (4) learning sessions that discussed topics on branding and marketing; recruitment, retention and engagement; public relations; and integrated marketing communications. The first session tackled the different aspects of branding and marketing for associations, including marketing management, creating a brand for associations; the importance of positioning statement and strategy; and product differentiation. The second session discussed the roles of marketing for associations; members recruitment strategy; media channel strategy; profiling of membership; and the whole membership journey. The third session tackled the Volatile, Uncertain, Complex and Ambiguous (VUCA) strategy for better communication; the difference between risk, issue, and crisis in public relations; the anatomy of crisis that affects organizations; the kinds of crisis affecting members; the 10 golden rules of crisis management; and the 3 new rules for digital VUCA. The fourth session discussed and dissected the whole aspect of the integrated marketing communication (IMC) for the growth and development of associations. The speakers who shared their expertise during the seminar were Ms. Gwen Albarracin, President and CEO, Center for Pop Music and PCAAE Board of Director; Ms. Yayu Javier, President and COO, AVANZA and PCAAE Board of Director; Ms. Amor Maclang of GeiserMaclang Marketing Communications Inc.; and Ms. Alpha Gracias C. Allanigui, Chief Strategy Officer, United Neon Group of Companies. For more details of this seminar and the CPAE program of the PCAAE, please contact Mr. Enrique Florencio of the PCAAE Secretariat at [email protected].